But we also had another artist who lived in Leigh and also painted Leigh and who also married into an exceptionally artistic family. This was Edith Louisa Minnie Heath who married the artist, William Egerton Hine at Leigh on 1 October 1887. The village has in its possession a picture by Edith Hine dated around 1887/88 showing Forge Row and the Church, but more about that picture in Part 2 below. According to her grandson, Michael Wace, who has some of Edith’s paintings, he believed she was probably a better artist than her husband but gave up once she started a family. She painted some accomplished copies of Turner’s Venetian watercolours which she sold to help pay for family holidays. 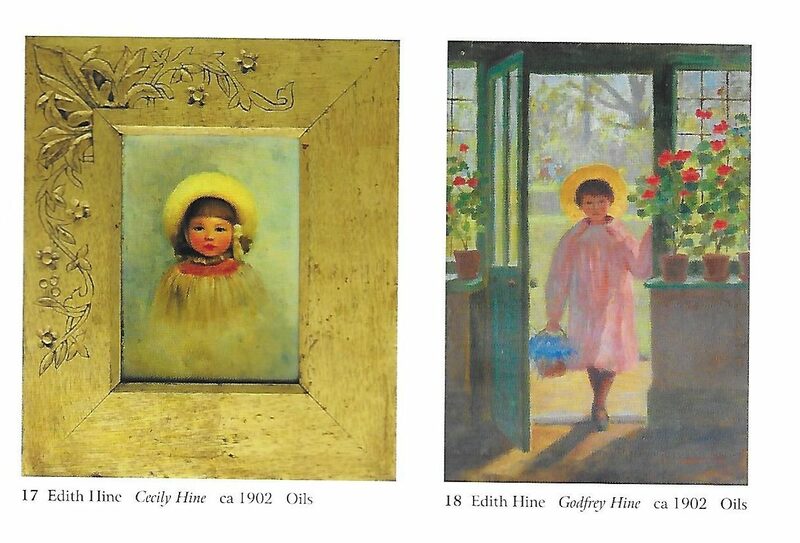 Below is a picture of Edith Hine herself in later life and some of her paintings. Edith Louisa Minnie Hine was a member of the Heath family who lived at The Cottage (now The Woods) in Leigh from 1879. It is in 1879 when Mrs Heath signed the lease for Leigh Cottage, although her embossed writing paper shows she used the name The Woods. The family were there on and off until 1946. Agnes Heath (nee Richardson), the mother and a widow, died in 1912; daughter Florence Heath died in 1936 aged 77. In 1939 both Edith Hine, by then a widow, and Maud Heath were living at the Woods and Maud Heath died in Leigh in 1946. 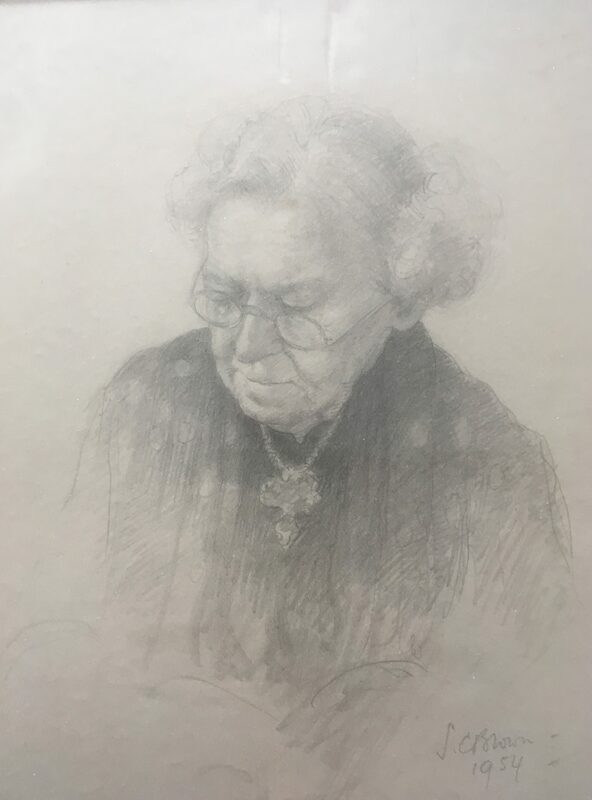 Following Maud’s death, Edith went to live with her daughter, Marjorie Wace in Hampshire, where she died in 1960, her Will left her effects to her son, Alfred Gordon Hine DSO. (Lawrence Biddle had written in his book “Leigh in Kent 1550-1900”, page 52, that the last of the three Heath daughters died in 1946 which is incorrect). Edith (Louisa Minnie Heath) was born at Leamington as were her two sisters, Maud Agnes and Florence Marian and a brother, Arthur Jones Hodsoll Heath (who died shortly after birth) but she was the only one to marry. Their father was Albert Hodsoll Heath who was born at Blackheath on 26 July 1827, the son of James Hodsoll Gordon Heath and Sarah Pidding: James is described as a gentleman in the 1827 baptismal entry for his son, Albert. James Hodsoll Gordon Heath, b. 1793, died in 1875, death registered at Tonbridge. 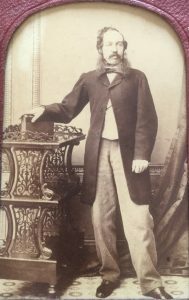 In 1851 Albert is still living at Blackheath and is described as an artist, portrait painter, and he is one of many siblings. 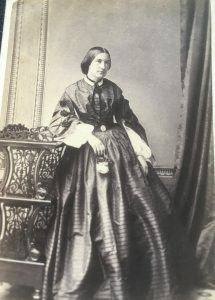 Their mother, Agnes Mary, was the daughter of Charles and Louisa Ann Richardson (née Lenox) and was living at Croydon at the time of her marriage in 1857. Agnes herself was born at Hackney in 1826 where the family had previously lived. She was one of five siblings – Georgiana Harriet, Louisa Grace, Mary Harris and Charles Lenox Richardson. Before her marriage, in 1851, Agnes Mary Richardson had been working at Tonbridge – at Oakhill where she was a school mistress – her younger sister Mary was a pupil there. Although Lawrence Biddle in his book “Leigh in Kent 1550-1900” p.52 wrote that Agnes Heath’s one son had died at the early age of 26 and had gone out to the Far East and brought back some valuable china after the loot of Peking in 1900, this could not have been the case. Agnes’ only son, Arthur, had been baptized in April 1862 but died shortly afterwards in April 1862. Information, however, has come to light from Michael Wace, Agnes’ great-grandson, who has revealed that it was, in fact, Charles Lenox Richardson, Agnes Mary Heath’s younger brother who had brought back the china. Charles had been a merchant in Shanghai, China in the 1850s and also in Japan and, therefore, the china brought back would have been during that period, whether looted or not. Born in 1833, Charles Lenox Richardson had gone out to the Far East in 1854 and had been killed in Japan in 1862 in an incident which became known as the ‘Namamugi incident’ and more information about this event which led to the Anglo-Satsuma war is available on-line, as well as now in a new book “The Ghost of Namamugi: Charles Lenox Richardson and the Anglo-Satsuma War” by Robert Fletcher, published by Renaissance Books, which re-tells the story of his time in the Far East, using original letters from Richardson to his family, found by Michael Wace and given to the author. (The letters had been inherited by Eileen Hine, the wife of Captain A Gordon Hine, Edith’s son). A brief item about this is also on the website – see Origins of the Chinese Porcelain at The Woods. Following the killing and the subsequent war and pressure from the British government, the Richardson family received financial compensation for the death of Charles Lenox Richardson in the sum £10,000, a considerable sum (about £1.2 million today). Charles Lenox Richardson’s Will also left his personal wealth and effects to his sister, Agnes. This money enabled the family to move up in the world – and, later, Agnes Mary Heath, as a widow, was able to rent The Woods, wear fine clothes and own and ride in carriages. 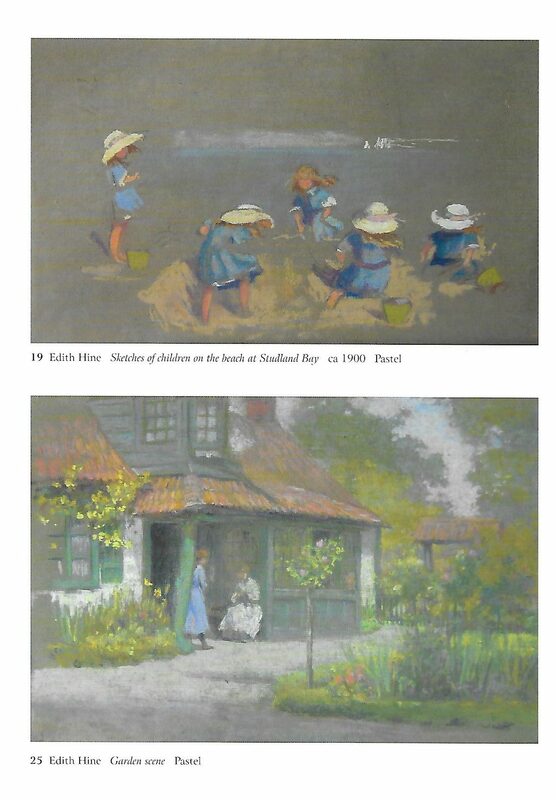 The family did have their china on display in the Woods, and Edith Hine painted the following which shows some of this china. Unfortunately, it is not very clear but the carpet is Chinese, the vase on the left hand side is Chinese; the plate above the door was designed by Maud Heath, and the round vase is Chinese. Inside The Cottage – The Woods – a painting by Edith Hine, showing some of the China brought back by Charles Lenox Richardson. In 1871 Agnes is living in Tonbridge with her children. She is living with her mother, Louise Richardson (née Lenox)[ii], who is now a widow. Agnes’ father, Charles, had died in 1868 according to Michael Wace. Whether Agnes moved there to be with her mother, or whether her mother moved there to be with Agnes, we do not know. But the 1871 census gives Louisa Richardson as the head of household, rather than Agnes. The three daughters are described as Louisa’s grandchildren. Louisa Richardson death was registered in Tonbridge in 1876, although her Will dated 22 June 1876 states she died at 2 Culverden Park Tunbridge Wells on 1 June: it could be she was staying with her daughter, Agnes Mary Heath, who was at that time living there. Agnes Mary Heath was still at 2 Culverden Park in 1878, but by 1879 she and her children had moved to Leigh, to the Cottage (now the Woods) in 1879. In the 1881 census, however, only Florence now aged 22 and Maud aged 20, with two staff are there. Agnes appears to be at Brighton, described as a lodger, living on ‘dividends’ with Thomas Lacey and Elizabeth, plus Agnes Lenox aged 35 born at Tottenham and Rose Lenox aged 59 born in Truro. Research has shown the connection to these two Lenox women and can be seen on the Family Tree on our website. The connection to Thomas Lacey and Elizabeth, however, has not been determined: it could be purely coincidence or perhaps even they are distant relations. Edith Louisa M Heath herself has been hard to find in the 1881 census – she may have been away at school – there is a E. Heath at a Fulham school in 1881, but says born St John’s Wood – yet Agnes Mary herself went to a school in Kensington, Fulham in 1841. But it could just be illegibility of the records or poor transcription being the reason she cannot be found. Also living in Leigh in 1881 is Agnes Mary Heath’s widowed sister, Mary Harris Ridgeway. The 1881 census does not say where but she is living about six properties from the Bat & Ball (heading towards the school). Occupation given as “funded property”. They had married in 1864 at Tonbridge but her husband, William, had died at Plomesgate, Suffolk in 1880. At that time her son Charles, aged 8, would have been away at school as also her two daughters, Kate and Evelyn. In 1891, Agnes is living at Leigh, along with Florence and Maud, and a nephew Charles Ridgway (son of her sister Mary Harris Richardson and William Ridgeway) and the grandson, Godfrey V B Hine, aged 4 months, born at Reigate in Surrey. Edith had married William Egerton Hine (1851-1926) on 1 October 1887 at Leigh. She was his second wife. His previous marriage had been to Lilian Croft (daughter of Robert Charles Croft, a doctor of Medicine) in 1882 at St Pancras and they had a son, Frank Croft Kingsley Hine, born at Ripley in August 1883. However, Lilian died the following year and her death is registered at Carnarvon in 1884. When Edith married William Egerton Hine, she became the stepmother to his first child as well as having children of her own. There were four further children, Alfred Gordon, Godfrey, Marjorie and Cecily, a fifth, a daughter Maud died a week after birth in 1894. In 1891 Godfrey is with his grandmother, Agnes, and aunts at Leigh and Edith is at Reigate with her husband and other children. She is 27 and described as an artist, painter – pastels and sculptress. William is 39, an artist, teacher of drawing and painting in a school. Frank C Kingsley Hine is now 7; and their new son, Alfred Gordon Hine, aged 2, is with them. In 1901 Edith was staying with her mother at The Cottage in Leigh: her two sisters are there, still single, and two of her children, Marjorie A Hine, born Harrow and aged 4; and Cecily Lennox Hine, born Harrow aged 4 months. There are domestic staff at Leigh also, including a ‘monthly nurse’ perhaps to help Agnes and a child’s nurse to help with the little ones. Meanwhile in 1901 William Hine is living at Westcott, Harrow – with two of his boys Alfred, aged 12, and Godfrey aged 10, plus two staff. 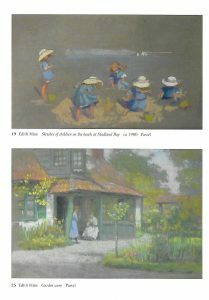 By now, William Egerton Hine is teaching at Harrow School where, according to peasant-arts.blogspot.com[iii] under Hine Family Artists, he worked from 1892-1922 and he also taught Cecil Beaton. There is a sketch of William Egerton Hine attributed to Cecil Beaton at the National Portrait Gallery. In 1911, Edith is back at Harrow on the Hill with her husband, with Godfrey, now 20, Majorie, 14 and Cecily, 10. Kingsley and Gordon would be 27 and 22 respectively and are no longer at home. Agnes Heath died in 1912. By then, she had an estate valued at £6309.14 which was divided between her daughter, Florence Marian Heath and son-in-law, William Egerton Hine. Maud and Florence continued to live, single ladies, at The Cottage (The Woods). Florence painted and Maud taught woodcarving in the village, one of her pupils being Isaac Ingram (who made the carved frame surrounding the pastel of the Church and Forge Row which prompted this article) and one of the hymn boards for the Church. [iv] Florence died in 1936 and Maud in 1946. According to Betty Crawford[v] the two Miss Heaths were always trying to keep people busy and were great characters, elderly but sweet. They had a car and a chauffeur – unusual then; according to Doreen Passingham Miss Heath – does not say which one – at ‘The Woods’, even until she died, wore Edwardian style clothes and had a parasol. The Miss Heaths had organized various classes for the ‘working man’ in the village – perhaps influenced by the Peasant Arts movement, a movement based at Haslemere which ran from ca 1894 until the early1930s[vi] and which had been supported by their sister-in-law, Maude Egerton King (née Hine) and her husband Joseph King (see www.haslemeremuseum.co.uk). The window in the north transept of Leigh Church was installed in memory of Agnes Maria (Mary) Heath – Godfrey’s grandmother who had died in 1912. The figures are of St John and St James – copied from those in Winchester College Chapel. Godfrey, at that time employed in the studio of Archibald Nicholson, carried out the work in memory of his grandparents and used the Winchester window as his model but inserted the family coat of arms at the foot. The window shows the Heath coat of arms “a chevron sable between three moorcocks on an ermine ground” surmounted by the Heath crest of a tower argent flambant proper and the motto ‘hanc fenestram donum dedit Agnes Maria Heath in deo laudem. [viii] However, Michael Wace, Edith’s grandson, believes the coat of arms might be phoney, possibly made up by Florence. Godrey did not sign the work and his technique is not yet as refined as that of his mentor. After Florence’s death in 1936, Maud continued to live at the Woods; in 1939 her sister, Edith Hine, by now a widow, William having died in 1926 at Haslemere, is there with her. When Maud died in 1946 her funeral was attended by Mrs Hine and Captain G Hine and a Mrs Heath and Major H Heath. (Mrs Hine, Eileen, was Captain Hine’s wife). I have not yet been able to ascertain who Major H Heath was: he might have been Walter Hodsoll G Heath, first cousin once removed, but his rank was only ever a Lieutenant in RAF). Maud’s estate was passed to Lloyds Bank to deal with finding beneficiaries to her estate, so Edith must have moved away by then. She died in Hampshire in 1960. Her Will left her estate of £5405 to her son Alfred Gordon Hine DSO. The Heath family were fairly well-off. Many family members left sizeable estates in their Wills: Rosetta Eliza Heath and Flora Staniforth Heath (sisters of Albert Hodsoll Heath) both died spinsters and both left their estates to Charles Herbert Philpott and Olive Mary Heath (daughter of Walter Brougham Heath, the brother of Albert Hodsoll Heath). I mention Philpott because the name comes up again – Emma Caroline Heath, wife of Walter Brougham Heath, shared her home with a Mary Ann Philpote in 1911, her sister: so perhaps Charles Herbert Philpott is another relative of the family, a nephew to Rosetta and Flora. What has not yet been mentioned in any detail is the other side of the family – the marriage of Edith to William Egerton Hine. 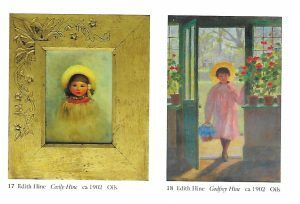 Edith and her siblings were artistic, Edith’s father was described as an artist, and when she married she married into art in a considerable way. The family of William Egerton Hine was famous in its time. His father, Henry George Hine (1811-1895) came from Brighton, the son of an ostler and coachman. Henry started in the art world as a freelance black and white illustrator and worked on publications such as Punch and other books. He was one of the many illustrators for “Mayhew’s London” and in the edition “The Illustrated Mayhew’s London” 1986, his signature where visible can be found on p.13 London Costermonger; p.69 Irish Street Seller; p86 Baked Potato seller; p 99 Long-song selling. He showed a comic style in his illustrations. He became a well-known landscape artist who exhibited at the Royal Academy in 1830. 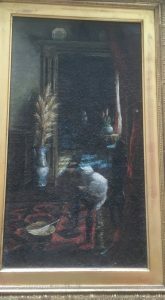 His paintings are represented in our national collections and still come on to the market today[xi]. In fact, the Hine family were artists through and through. William’s mother, Mary Anne Eliza Egerton was also described as an artist and the Egerton name is handed down to many of their children, sons and daughters alike. Although from Brighton, most of Henry Hine and Mary Anne Eliza Egerton’s children were baptized at St Pancras in London and the family lived mostly at St Pancras. Henry (Harry) William Hine (1845-1942) artist, landscape painter: married Victoria Susanna Colkett (artist) daughter of Samuel David Colkett, artist. William Egerton Hine would die at Haslemere on 14 February 1926 and was buried at St Bartholomew, Haslemere on 17 February 1926. His sister Maude Egerton King died at Haslemere in 1927. 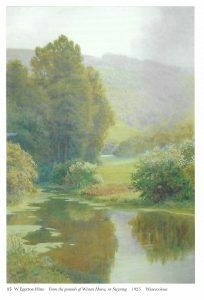 Their presence at Haslemere led to the connection with the Peasant Arts movement mentioned above which came to be based at Haslemere and continues in some way via the Haslemere Educational Museum (www.haslemeremuseum.co.uk). In William’s Will he left his effects to Harry Sutton Palmer artist and Alfred Gordon Hine, commander RN, his son: effects £519 2s 9d. His wife is not mentioned but perhaps she had already been provided for. 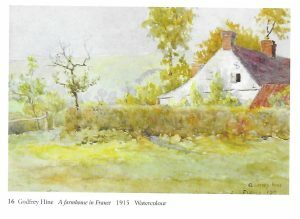 To see some of the many of the paintings of the Hine family you can look on the internet, as they have been sold over the years and appear on various art-related websites. 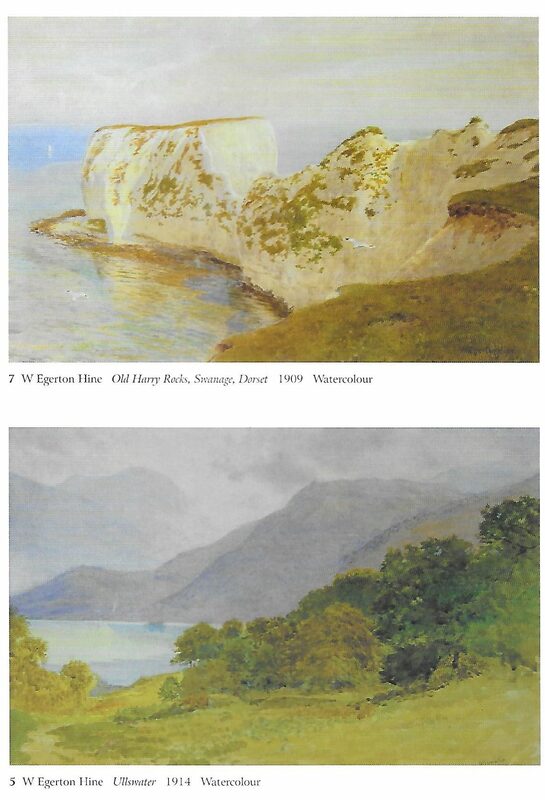 Below are some of the paintings of William Egerton Hine. Michael Wace has given the Society a copy of “The Hines at Harrow: a family of artists” – the exhibition catalogue of works at Harrow School in 2002/2003 with some further background on the William Egerton Hine and Edith Hine, plus many family photographs. Before the erection between of South View (1890) and the new Forge Square of 6 cottages (7 homes) ca? 1888-1890. It is the only picture we have which shows the layout of the cottages at that time. The charity cottages are there; then there are three buildings which appear to consist of one small cottage, plus two larger cottages which would have been known as Forge Row and provided accommodation for 6/7 households, at the very end of the picture, quite indistinct, is the Forge. The village has been given a painting by Edith Hine (née Heath), daughter of Mrs Agnes Heath, who lived at The Woods. Edith Hine is described as an artist and sculptress in the censuses. 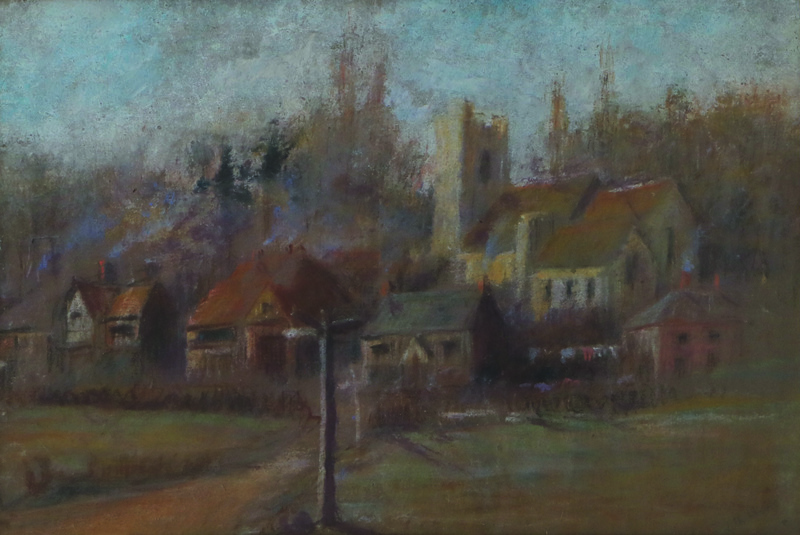 The picture is a pastel painted ca 1887/88 of the church viewed probably from near the vicarage which also shows the vestry cottages and the three individual buildings which would have made up Forge Row and at the very end of the picture, quite indistinct, the Forge. This is the only picture we have of this area of the village before Samuel Hope Morley pulled down Forge Row and replaced it with the current cottages of Forge Square and South View. South View was built in 1890 and Forge Square a little before that – Lawrence Biddle in his book says about 1885 – but this picture actually pin points the date more closely, for Edith only married William Egerton Hine on 1 October 1887 and the picture is signed Edith HINE. There is a copy of this picture on the Leigh Historical Society website and the original is in the Genner Room of the Church. On the back of the picture is a slip of paper which reads “Frame carved by Isaac Ingram in 1882. He was taught carpentry and woodwork by Miss Maud Heath of The Woods. The painting is by her sister Mrs Edith Hine. Lent by his grand-daughter Mrs D Dale, Barnett Road, Leigh.” However, although the frame may have been carved in 1882, the pastel itself could not have been painted before 1887 for reasons stated above. We have more information ascertained from the 1871 census and from the 1870 Hall Place Sales Particulars on the three cottages of Forge Row shown in the picture which housed several households. The cottages formed part of Lot 5 and are described as no. 54, no. 55 and no. 56 on the map of the Sales Particulars. They are not the vestry cottages which belonged to the Church not to the Hall Place estate. The cottages are described as being situated on the south side of Leigh parish church, by the side of the road facing the Green. Firstly, No. 54 on the plan – a pair of cottage dwellings, under one roof, built of brick, timber and slate, 9 rooms, with garden. Lived in by Richard Tidy, 5 rooms, 10 perch. And George Sales, 4 rooms and gardens 20 perch. Secondly, No. 55 on the plan – a detached cottage dwelling, situate close thereto, brick, timber and tile, 5 rooms with garden, lived in by William Shoebridge. Thirdly No. 56 on the plan – is a single building – one roof brick and tile, with good gardens, situate adjoining the preceding and which is divided into four cottage dwellings. The four lettings are to: George Simmons, 4 rooms; Thomas Batchelor 5 rooms; John Turner 3 rooms; Mrs Rye and J Rye 3 rooms. These cottages at the time were known as the Row or Great Boydens which according to Lawrence Biddle consisted of one block of three cottages and two semi-detached cottages – this doesn’t quite tally with what we have above – which describe three buildings, one being a pair of cottages, one a single detached cottage, and one divided into four homes – designed to house seven ‘households’. When we look at the 1871 census, the numbers given relate to the number of the schedule rather than buildings but we can link the Sales Particulars and the 1871 census. Next comes the Smithy which in 1871 was a working forge only; Forge Cottage which is next to it was not yet built in 1871. In the 1881 census, at Forge Row there are the four cottages under one roof which were lived in by Messrs. Shoebridge, Turner, Passingham, Henry Day (i.e. no.56 in the Sales Particulars), but the two buildings which would have been No. 54 a pair of cottages under one roof and No. 55 a detached cottage are not easy to identify. George Sales might have lived in one but he also might have lived in what is now Forge Cottage. One of the two buildings might have been what is called in the census ‘Cottage Home’, with matron Mary Root and six other residents which was a possible convalescent home created by Samuel Morley to house his London workers while they convalesced, using an existing cottage (or perhaps two cottages) but this ‘Cottage Home’ is not listed consecutively with Forge Row in the 1881 census. The census seems to jump from one end of the village to the other and then back again. What is clear, however, is that Forge Row consisted of 7 households and when Forge Square was built to replace these cottages by the son, Samuel Hope Morley, he created cottages to house 7 households – nos. 1-5 Forge Square and the maisonette of 6 and 7 Forge Square – as well as a dedicated convalescent home (as opposed to using an existing cottage as in 1881). It 1891 it was again called Cottage Home, but today we know it as South View. [i] At www.findagrave.com for Hildenborough, Albert Hodsoll Heath’s gravestone is listed and the photograph of the gravestone shows a death date of Dec 26 1863. [ii] In the records – the spelling of Lenox varies between that and Lennox: however, the family today say that the spellling is actually ‘Lenox’ and this has been used in this text. [iii] There is a website called the “Haslemere Peasant Artists” The website and peasant-arts.blogspot.com gives further information on the various Hine family artist and states that William Egerton Hine bequeathed Longdene Copse to the movement (having not seen a copy of the Will, I cannot verify this). On the blogspot, Edith is mentioned, but erroneously, stating that she was another daughter of Henry G Hine, but although they did have a daughter baptized Edith Egerton Hine on 14 August 1861 at St John Baptist Camden, this baby died on 11 August 1864 at St Pancras. Thus the Edith named on the website has to be William Egerton Hine’s wife, Edith (Nee Heath). [iv] Ike Ingram was a cricket ball maker most of his life but in his youth he played cricket for Kent, earning money as a player rather than a gentleman. Although he always talked about his prowess, he only played a few times for Kent but it did include playing against WG Grace. Ike died at Oak Cottage in 1944 (age 90). He carved the frame for the pastel by Edith Hine and also craved one of the hymn boards in the church. [v] See Chris Rowley “We Had Everything . . .” p.274 and p. 286. [vii] Notes about Archibald Keightley Nicholson come from an article by Professor Michael Durey and also from Wikipedia. Examples of Nicholson’s works can be found via the internet with their location. At the time of the Hine memorial, Nicholson was working from his studio at 105 Gower Street. During his lifetime he is said to have produced 700 works, not just memorial windows such as ours at Leigh but also works for many cathedrals – for the Lady Chapel of Waltham Abbey Church which has three windows by him – the Edward Elgar Memorial Window at Worcester – and windows at Newcastle, Chester, Lincoln cathedrals among others. The full article by Prof Durey on Godfrey Hine and his involvement in the Great War can be found at: www.greatwarbritishofficers.com/index_htm_files/Hine.Godfrey.pdf. [viii] Lawrence Biddle ‘Leigh in Kent 1550-1900’ p. 108 refers erroneously to Godfrey Hine being employed by William Nicholson. He also says that the window was in memory of his grandparents – however Albert Hodsoll Heath’s name is not mentioned on the window only Agnes Mary. [ix] Lawrence Biddle ‘Leigh in Kent 1550-1900’ p.108 again refers to William Nicholson and erroneously credits him with designing the Hine window. [x] Copy of the article is in the Leigh Archives but can be found on the Findmypast website.